By all measures, the Canton Rotary Club's $5,000 grant to run Canton Elementary School STEM Academy's first-ever Fall Festival and Book Fair on Saturday, October 22 was money well spent! 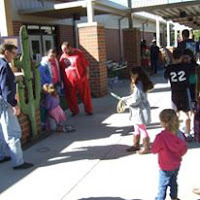 The event was held to promote family involvement in the school, which serves a 85% free-and-reduced lunch student population. A glorious fall day saw dozens of families come out for children to play games, pet animals, have their faces painted, win cakes and tickets to a Halloween show at a cake walk, and choose a free book for each child. Most of the Rotary District-Canton Rotary grant funded a free paperback book for each of the 800-plus children at Canton Elementary, many of whose families do not have enough disposable income to buy a book. 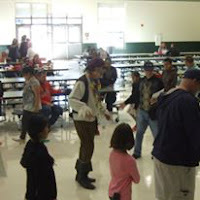 Smiles and laughter abounded throughout the school during the three-hour festival which saw special appearances by Schmee the Yiddish Pirate, who ran the cake walk, and Geronimo the Mouse, who meandered through the festival and danced to the continuous upbeat music. The dozen Rotarians who helped run the event so that teachers and their families could enjoy the event were assisted by a dozen members of the River Ridge High School Interact Club and Faculty Advisor Lyn Orletsky. Many thanks to all those who participated in the Canton Elementary School Fall Festival and Book Fair, an event that will be remembered for many years to come! 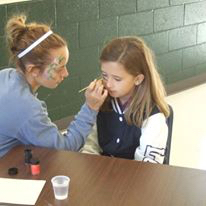 A River Ridge High School Interact student face painting at the Canton Elementary School STEM Academy Fall Festival and Book Fair. 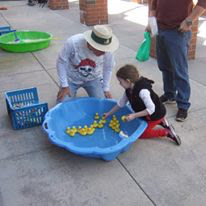 Canton Rotary Club Sergeant at Arms Bill Cornelius ran the duck pond game. Schmee the Pirate (Past Assistant Governor Peter Gleichman) helped these students do the cake walk instead of walking the plank! 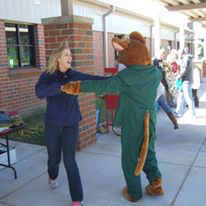 River Ridge High School Interact Club Faculty Advisor Lyn Orletsky dancing with Geronimo the Book Mouse a/k/a Canton Honorary Rotarian Francisco Lozano at the Canton Elementary School STEM Academy Fall Festival and Book Fair on Saturday, October 22. Canton Rotary Club Immediate Past President Jerry Cooper encourages a student doing the ring toss at the Canton Elementary Fall Festival and Book Fair. I hope the bigoted teacher is gone. 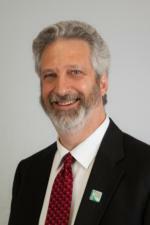 Lyn Orletsky the biased and bigoted teacher needs to be fired, the district sued, and a lawsuit made against the offensive word cherokee.